To Cite: Uzun I, Gunduz K, Celenk P, Avsever H, Orhan K, et al. Comparing the Effect of Different Voxel Resolutions for Assessment of Vertical Root Fracture of Permanent Teeth, Iran J Radiol. 2015 ; 12(3):e18290. doi: 10.5812/iranjradiol.18290. Background: The teeth with undiagnosed vertical root fractures (VRFs) are likely to receive endodontic treatment or retreatment, leading to frustration and inappropriate endodontic therapies. Moreover, many cases of VRFs cannot be diagnosed definitively until the extraction of tooth. Objectives: This study aimed to assess the use of different voxel resolutions of two different cone beam computerized tomography (CBCT) units in the detection VRFs in vitro. Materials and Methods: The study material comprised 74 extracted human mandibular single rooted premolar teeth without root fractures that had not undergone any root-canal treatment. Images were obtained by two different CBCT units. Four image sets were obtained as follows: 1) 3D Accuitomo 170, 4 × 4 cm field of view (FOV) (0.080 mm3); 2) 3D Accuitomo 170. 6 × 6 cm FOV (0.125 mm3); 3) NewTom 3G, 6˝ (0.16 mm3) and 4) NewTom 3G, 9˝ FOV (0.25 mm3). Kappa coefficients were calculated to assess both intra- and inter-observer agreements for each image set. Results: No significant differences were found among observers or voxel sizes, with high average Z (Az) results being reported for all groups. Both intra- and inter-observer agreement values were relatively better for 3D Accuitomo 170 images than the images from NewTom 3G. The highest Az and kappa values were obtained with 3D Accuitomo 170, 4 × 4 cm FOV (0.080 mm3) images. Conclusion: No significant differences were found among observers or voxel sizes, with high Az results reported for all groups. Copyright © 2015, Tehran University of Medical Sciences and Iranian Society of Radiology. This is an open-access article distributed under the terms of the Creative Commons Attribution-NonCommercial 4.0 International License (http://creativecommons.org/licenses/by-nc/4.0/) which permits copy and redistribute the material just in noncommercial usages, provided the original work is properly cited. Vertical root fractures (VRFs) are usually characterized by an incomplete or complete fracture line that extends along the long axis of the root to different levels of the root (1-3). The major causes for VRFs are root canal treatment and excessive operative procedures performed in the root canal (4). VRF may lead to development of bony lesions; radiographs of which show halos, perilateral radiolucency and angular resorption of the crestal bone (5, 6). Such radiographic findings require clinician to make an accurate diagnosis. In VRF, the fracture runs lengthwise from the crown toward the apex and is usually oriented buccolingually. While the clinical presentation of a VRF can be variable, radiographic signs are quite specific. These signs can vary considerably from case to case, depending on the angle of X-ray beam in relation to the plane of fracture, as well as the duration after the fracture and the degree of separation of the fragments (7). The fracture line is visible in radiographs when the path of X-ray is parallel to the plane of fracture (8). Otherwise, the fracture line is not visible on two-dimensional radiographs, especially in primary stages when the fracture is a tender crack without detached fragments (8, 9). Many cases of VRFs cannot be diagnosed definitively until the extraction of tooth. However, teeth with undiagnosed VRFs are likely to receive endodontic treatment or retreatment, leading to frustration and inappropriate endodontic therapies. General practitioners may correctly diagnose VRFs only after endodontic failures. As a result, complications associated with VRFs are usually considered a consequence of endodontic or restorative procedures (10). In both clinical (11, 12) and ex-vivo (13, 14) studies, cone beam computerized tomography (CBCT) has been used to detect VRFs. CBCT detected twice as many teeth with VRFs as did periapical radiographs (11, 14). Therefore, when CBCT is not used, teeth with VRFs, especially those in the early stages, may be undiagnosed. This lack of diagnosis also indicates that previous estimations of the low prevalence of VRFs may have been underestimated (15, 16). With recent emergence of CBCT in dentistry and its advantages over conventional CT, researchers have been encouraged to assess this relatively new technique for the detection of root fractures (11, 14-20). Image quality has been described as the visibility of diagnostically important structures in the CT image (19, 20). Voxel size has been reported to have a positive correlation with image quality (e.g. contrast and resolution), as well as exposure dose (21, 22). In the literature, a few studies assessed the influence of voxel size on diagnostic ability of CBCT unit in evaluating simulated VRFs. This study aimed to assess the use of different voxel resolutions of two different CBCT units in the detection of VFRs in vitro. Table 1 shows the intra-observer kappa coefficients calculated for each observer by image type. Higher intra-observer agreement was obtained by comparing images from 3D Accuitomo 170, 4 × 4 cm FOV (0.080 mm3) and 3D Accuitomo 170, 6 × 6 cm FOV (0.125 mm3) with those from NewTom 3G, 6˝ FOV (0.16 mm3) and NewTom 3G, 9˝ FOV (0.25 mm3). Intra-observer kappa coefficients ranged identical values of 0.973 for the 3D Accuitomo 170, 4 × 4 cm FOV (0.080 mm3) images, while ranged from 0.782 to 0.945 for the 3D Accuitomo 170, 6 × 6 cm FOV (0.125 mm3) images, suggesting notably good intra-observer agreement. Table 2 shows inter-observer kappa coefficients for both the first and second readings by image type. Higher inter-observer agreement was obtained from the 3D Accuitomo 170, 4 × 4 cm FOV (0.080 mm3) and 3D Accuitomo 170, 6 × 6 cm FOV (0.125 mm3) images compared with those from NewTom 3G, 6˝ FOV (0.16 mm3) and NewTom 3G, 9˝ FOV (0.25 mm3). Very good inter-observer agreement was found for the first and second readings from the 3D Accuitomo 170, 4 × 4 cm FOV (0.080 mm3) images (i.e. the same as 0.973). Moreover, a good inter-observer agreement was found for the 3D Accuitomo 170, 6 × 6 cm FOV (0.125 mm3) (from 0.888 to 0.946). In general, a good inter-observer agreement was found for the first and second readings for the NewTom 3G, 6˝ FOV (0.16 mm3) and NewTom 3G, 9˝ FOV (0.25 mm3) images. a Abbreviations: SE: Standard Error. a Abbreviations: SE: Standard Error, Obs1: Observer 1, Obs2: Observer 2. 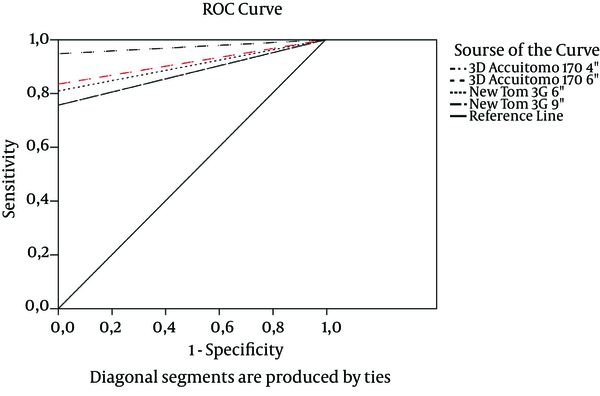 The areas under the ROC curves (Az values) for different observers, readings and image types were calculated and are shown in Table 3. Higher Az values were obtained for the 3D Accuitomo 170, 4 × 4 cm FOV (0.080 mm3) and 3D Accuitomo 170, 6 × 6 cm FOV (0.125 mm3) images than for the NewTom 3G, 6˝ FOV (0.16 mm3) and NewTom 3G, 9˝ FOV (0.25 mm3) images. The Az values of readings from both observers were higher for the 3D Accuitomo 170, 4 × 4 cm FOV (0.080 mm3) than for the 3D Accuitomo 170, 6 × 6 cm FOV (0.125 mm3) images compared with NewTom 3G, 6˝ FOV (0.16 mm3) and NewTom 3G, 9˝ FOV (0.25 mm3) images. The Az values of the 3D Accuitomo 170, 6 × 6 cm FOV (0.125 mm3) images were also higher than those of NewTom 3G, 6˝ FOV (0.16 mm3) and NewTom 3G, 9˝ FOV (0.25 mm3) with the exception of the first reading by observer one. Figure 5 shows the ROC curves for observer one for the first reading for each image type, while Figure 6 shows the ROC curves for observer two for the second reading for each image type. Comparisons between modalities are shown in Table 4. In Table 4, the Az values are compared according to Z test, which was defined by McClish et al. (24). The table shows the Z test values together with significance between them. P values lower than 0.05 were considered as statistically significant. The first observer yielded the highest Az scores with 3D Accuitomo 170, 4 × 4 cm FOV (0.080 mm3) in the first reading. In addition, the first reading by the second observer also yielded the highest Az scores for the 3D Accuitomo 170, 4 × 4 cm FOV (0.080 mm3). However, in the second readings by both observers, the Az values increased for the 3D Accuitomo 170, 4 × 4 cm FOV (0.080 mm3), 3D Accuitomo 170, 6 × 6 cm FOV (0.125 mm3) and NewTom 3G, 6˝ FOV (0.16 mm3). The reason for the gradually increasing scores may be that both observers started to score images from 3D Accuitomo 170, 4 × 4 cm FOV (0.080 mm3) and later switched to other modalities, which may have increased observer experience with reading images with VRFs. However, NewTom 3G, 9˝ FOV (0.25 mm3) showed the lowest Az values both in the first and second scores, even though the observers presumably became more accustomed to the examination procedures. As such, the 3D Accuitomo 170, 4 × 4 cm FOV (0.080 mm3) was found to be the most efficient and powerful imaging modality for detection of fractures. When NewTom 3G was assessed separately, Az values for 6˝ FOV (0.16 mm3) were higher than those from the 9˝ FOV (0.25 mm3) images, indicating a statistically significant difference. Given the fact that lower Az values for NewTom 3G, 9˝ FOV (0.25 mm3) depend on the size of FOV and image quality of this modality. Figure 5. Receiver operating characteristic curves for observer one for the first reading for each image type. Figure 6. Receiver operating characteristic curves for observer two for the second reading for each image type. The present study compared the diagnostic accuracy of CBCT scans with different voxel resolutions in the detection of simulated VRFs. Both intra- and inter-observer agreement values were relatively better for 3D Accuitomo 170 images than the images of NewTom 3G. The highest Az and kappa values were obtained with the 3D Accuitomo 170, 4 × 4 cm FOV (0.080 mm3) images. This study evaluated the effects of voxel size on detection of VFRs using two different CBCT systems. Artificially stimulated vertical fractures were used, as previous studies showed them to be the most difficult to detect using intra-oral radiographs. Hassan et al. (14) compared five different CBCTs for the detection of VRFs and reported that the Next Generation i-CAT was the most accurate system (voxel of 0.25 mm) followed by the Scanora 3D (voxel of 0.2 mm), Accuitomo-XYZ (voxel of 0.25 mm), NewTom 3G (voxel of 0.2 mm) and Galileos 3D (voxel of 0.3 mm). Generally, performance was better with the 0.25-mm and 0.2-mm voxel sizes than with the 0.3-mm voxel size. Additionally, in an in vitro study assessing VRF detection using CBCT, Kamburoglu et al. (13) compared two different CBCT units (NewTom 3G and Iluma) with varying resolutions of 0.19-, 0.1- and 0.3-mm3 voxel sizes. They found that 0.19-mm3 and 0.1-mm3 voxel resolutions achieved better results than did the 0.3-mm3 resolution. 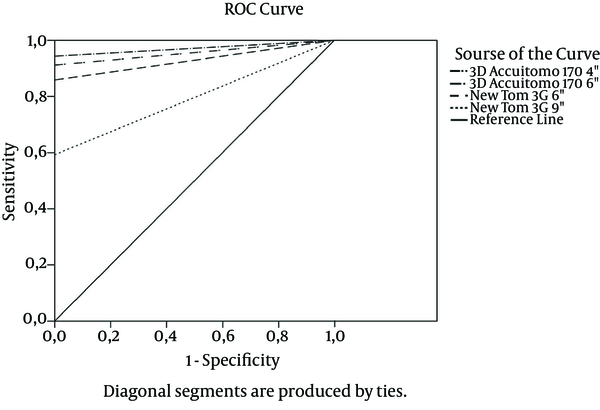 In another study, Ozer (25) compared the diagnostic accuracy of CBCT scans with different voxel resolutions in the detection of simulated VRFs. This author used only one CBCT (i-CAT) and found no significant differences among different observers or voxel sizes. The sensitivity and specificity results were high for all groups (sensitivity/specificity for 0.125 mm: 98/96; for 0.2 mm: 97/96; for 0.3 mm: 93/93 and for 0.4 mm: 91/93). Wenzel et al. (26) evaluated the diagnostic accuracy of CBCT and a photostimulable storage phosphor plate system (PSP) to detect VRFs. These researchers specifically used i-CAT scanner with 0.125-mm3 and 0.25-mm3 voxel sizes. Higher accuracy was reported with smaller voxel sizes; the 0.125-mm3 voxels showed a specificity of %98 and sensitivity of %87. These authors also reported that the 0.25-mm3 voxel resolution was more accurate than the periapical PSP system. High-resolution scanning was recommended in cases of suspected VRFs that could not be visualized using only periapical images. In the present study, no significant differences were found between observers or voxel sizes, with high Az results reported for all groups. The values revealed that all groups were similar for sensitivity and specificity. The Az results also showed that the 3D Accuitomo 170 (4 × 4 and 6 × 6 cm FOVs) and NewTom 3G, 6˝ FOV (0.16 mm3) systems were better than the NewTom 3G, 9˝ FOV (0.25 mm3) system. Accuracy results also showed that the 0.080-mm3, 0.125-mm3 and 0.16-mm3 resolutions were more successful than the 0.25 -mm3 resolution in detecting VRFs, although the latter two voxel resolutions were acceptable under clinical conditions. Before the newest sensitive flat-panel detectors (CMOS) were developed for CBCT units, a wide FOV required a larger voxel size due to computational limitations (27). First, the resolutions were limited. Even at the smallest voxel size, it was impossible to increase the resolution, which resulted from the focus size of the X-ray tube, the pixel size of the sensor and the precision of the rotation. Second, small voxel sizes led to increased noise (28). In such cases, radiation dose had to be increased to reduce the noise, although this adjustment was impractical based on the principle of ‘‘as low as reasonably achievable’’ (ALARA) (29). Recently, with the advent of new flat-panel technology, smaller FOVs can capture images with less ionizing radiation (30). In this study, charge-coupled device (CCD) and new flat panel technology imaging CBCT devices were used to detect VRFs. Although the devices showed similar results for all FOVs in the detection of VRFs, CCD devices with small FOVs emit more radiation than those with large FOVs. The four different voxel resolutions showed similar results for detecting simulated VRFs. However, if a high-resolution image is required, one should choose a voxel size of 0.080 and a limited FOV (4 × 4 cm) with a standard radiation dose, which may make reconstruction difficult using a personal computer. For instance, with treatment planning of dental implants over large areas, one should choose a voxel size of 0.125 mm3 or 0.16 mm3 and a low radiation dose to improve the noise in the images. In the literature, the effective dose from the cone beam CT units we worked with ranged between 11 and 102 μSv depending on the size of volume used, exposure parameters chosen and examined region (31). 3D Accuitomo 170 (4 × 4 and 6 × 6 cm FOVs) achieved 11-31 and 57-69 μSv (31), while NewTom 3G, 6˝ FOV and 9˝ system had effective dose level of 58-102 μSv (32). However, effective dose from a panoramic radiograph is 13 μSv (32), a cephalometric radiograph, 1-3 μSv (32), a periapical radiograph, 1-8 μSv (33) and an occlusal radiograph, 8 μSv. Despite small-volume CBCT doses being an order of magnitude or more below doses from conventional CT, they are still significantly higher than those from conventional dental radiography. While clinical applications of CBCT have expanded, current CBCT technology has limitations related to the ‘‘cone-beam’’ projection geometry, detector sensitivity and contrast resolution producing images that lack the clarity and usefulness of conventional CT images. The clarity of CBCT images is affected by metallic artifacts, noise and poor soft tissue contrast. However, still CBCT should be considered the most reliable imaging modality for the diagnosis of vertical root fracture as they can avoid scanning structures outside the region of interest susceptible to beam hardening (e.g. metallic restorations, dental implants) (16), although, another method was used in this study for simulating VRFs. Besides, for such studies (esp. for horizontal root fracture studies) joining or unifying the fragmented process is crucial, since if the fractured parts are approximated closely, the fracture line would be unclear and hard to diagnose and vice versa. In addition, making artificial fractures can lead loss of small fragments, which can make eventually a gap when joining the fragments together. Thus, investigators should use a strict standardized protocol when performing such artificial fractures. In the present study, no significant differences were found between observers or voxel sizes and high Az results reported for all groups. 3D Accuitomo 170 (4 × 4 FOV) has the highest sensitivity and diagnostic accuracy for detecting vertical root fracture among radiographic modalities. High-resolution scanning is recommended only in cases of suspected VRFs difficult to visualize using only periapical images. Authors’ Contributions: Study concept and design: Ismail Uzun, Kaan Gunduz, Peruze Celenk, Hakan Avsever, Kaan Orhan, Gozde Canitezer, Bilal Ozmen, Ersan Cicek and Erol Egrioglu. Analysis and interpretation of data: Ismail Uzun, Kaan Gunduz, Peruze Celenk, Hakan Avsever, Kaan Orhan, Gozde Canitezer, Bilal Ozmen, Ersan Cicek and Erol Egrioglu. Drafting of the manuscript: Ismail Uzun, Kaan Gunduz, Peruze Celenk, Hakan Avsever, Kaan Orhan, Gozde Canitezer, Bilal Ozmen, Ersan Cicek and Erol Egrioglu. Critical revision of the manuscript for important intellectual content: Ismail Uzun, Kaan Gunduz, Peruze Celenk, Hakan Avsever, Kaan Orhan, Gozde Canitezer, Bilal Ozmen, Ersan Cicek and Erol Egrioglu. Statistical analysis: Erol Egrioglu. Financial Disclosure: We had no disclosures of any commercial associations, current and within the past five years, that might pose a potential, perceived or real conflict of interest. These include grants, patent licensing arrangements, consultancies, stock or other equity ownership, donations, advisory board memberships or payments for conducting or publicizing the study. Funding/Support: This study was not supported by any institution.